LOVING DALSTON today has good news for fashion designer Katharine Hamnett and other campaigners against Hackney council’s use of a pesticide linked to cancer. This site can reveal that Hackney, while publicly fending of protesters with statements that glyphosate “has been declared environmentally friendly by government”, has been quietly looking at safer options. 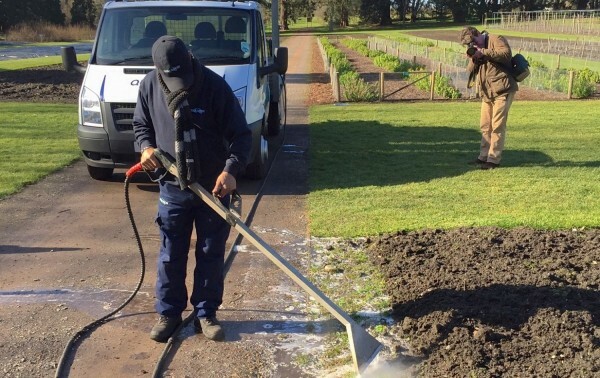 For several weeks council parks staff have tested Foamstream, which is said to kill weeds using “a precise application” of hot water and foam. Fraser Higson, of Weedingtech, which supplies the product, added: “Hot water is not economic, not viable — hence the introduction of foam.” He was awaiting Hackney’s decision. Hackney has been testing it for more than a month. The key point is that it does not use dangerous chemicals, instead using heat to make unwanted plants wither. Hamnett has been at the forefront of opposition to the Monsanto-made chemical since she saw park-keepers using glyphosate to kill weeds on a wildflower meadow near her London Fields home. 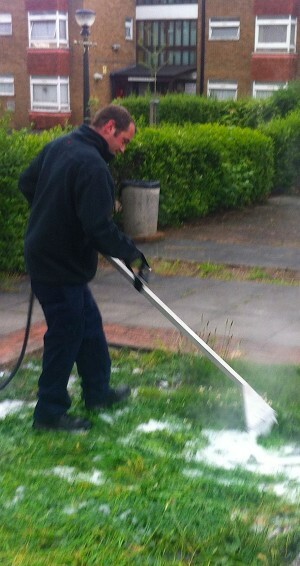 It has also been used on Shacklewell Green, Dalston, and elsewhere around the borough. Environmental campaigner George Monbiot says glyphosate, which garden shops sell as Roundup, is Monsanto’s “most successful herbicide”. But recently the list of countries that have introduced bans has grown and now includes the Netherlands. Colombia has decided it is too dangerous to use on illegal cocaine plantations. 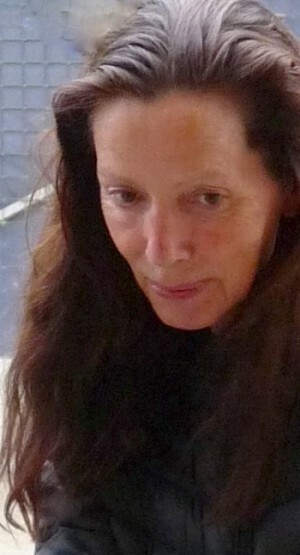 Hamnett made world headlines in 1984 when she wore a T-shirt with an anti-guided-missile to a well-publicised meeting with Margaret Thatcher, when she was Prime Minister. In 2011 the activist fashionista was appointed a CBE. * Top picture: a woman takes a stroll through the glyphosate-grown flower fields in London Fields. All pictures on this page that are © DavidAltheer [at] gmail.com are for sale for reproduction. Foamstream pix have been supplied. Most pix can be visually enlarged by pressing on them. There is a valid question of whether we should be using herbicides in this way at all, but the scare campaign against glyphosate (Roundup) is scientifically illiterate nonsense. The World Health Organisation (WHO) has listed glyphosate as a category 2A “probable carcinogen”. This puts it in the same category as coffee, chips and nightshift work. All these things have been linked to raised cancer risks, but that doesn’t mean we ban them, just that we take precautions. Our politicians and we as a community have to get better at understanding the science of this sort of thing, otherwise we fall prey to campaigners who simply look at words like “Monsanto” or “GMO” and decide on our behalf that something must be bad. A quick surf, avoiding the waves ridden by anti-genetic-modification outfits, Monsanto and other interest groups, turned up a wash (metaphor is, uhm, sinking) of scholarly papers that broadly seem to support your point, although deep (metaphor resurfaces) reading of all of them is not time-feasible in this office. – Ed.